Google used this design on February 8 for their logo in honor of Jules Verne’s birthday. The lever on the right controlled the direction of apparent travel through the submarine’s windows; up, down, right and left. Cute! Sometimes you just have to do things yourself! It looks like a smart idea to me! So as you probably know, as if NASA wasn’t shooting itself in the foot enough, Obamaspace killed the Ares program. Like the zombies of the recent media frenzy, however, it won’t stay dead. First, NASA found that they still had to pay for stuff they were getting because of a little thing called contracts with contractors. Now, ATK and Astrium have decided that if NASA won’t build it, they will – leveraging all that R&D ATK has put into solid rocket motors over the years, paid for by you and me, not just for Ares/Constellation, but back through the Shuttle program and all the other other solid motors they have built. I say, “Go for it!” No brand new second stage technology, all the major R&D paid for, let’s put ’em together and put some Orion spacecraft on top. Or whatever.There’s no reason why this shouldn’t be launchable from the modified shuttle pad (that’s also already paid for) so this is a pretty cheap alternative. Besides, it shows a “can do” spirit from EADS and ATK. 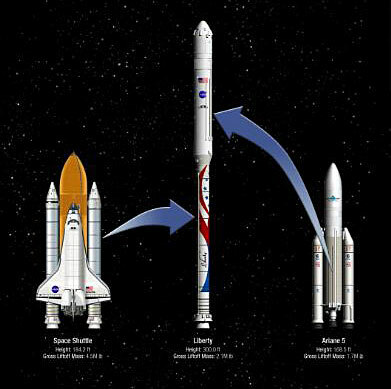 ATK had started a promotional advertising campaign before Ares was announced, saying that they could build a reliable, man-rated solid first stage; it ultimately became the basis for the Ares I design. The Ariane 5 has a pretty good reliability record and low insurance rates for a satellite launch system because of it, so it’s a tested and solid piece of hardware. Integration by these two experienced companies shouldn’t be an insurmountable problem. And they’re going to do it commercially, not as a NASA project! Sure they are using technology paid for by the taxpayers, but so what? Ever hear of the NACA airfoil shapes? NACA was the forerunner of NASA and they created a database of airfoil equations and data from wind tunnel experiments they did in the 1930s that was leveraged by every aircraft design company in the US. So I’ll be watching to see if the Liberty launch system is successful. It has a great pedigree – and that’s coming from me, who hates to admit anything from the Europeans is that good! You are currently browsing the The Old Gray Cat blog archives for the day Tuesday, February 8th, 2011.